Janet Gaynor and George O’Brien enjoy an outing to the city. Well, dear Reader, there’s no getting around it. We are not as sophisticated as we pretend. We, on the other hand, kept glancing at our wristwatch while screening it. But do not let our uncouth ways dissuade you from watching the 1927 masterpiece, Sunrise: A Song of Two Humans. For those of you who adore this movie, please don’t throw anything at us. You probably love all the great things there are to love about this movie – its use of perspective, its camera angles, its special effects. It is a stunning film and, as soon as you see the opening frame, you know the filmmakers have done something special here. If it feels European, it’s because it was directed by the hugely influential German director F.W. Murnau, who was brought to Fox Studios in 1926 to produce more highbrow, artistic films. He is a show-off who puts the most intricate details in a nondescript scene, and he makes it look effortless. Example: In one scene, O’Brien brings Gaynor to a quiet cafe in the busy city. The cafe is a serene oasis wrapped in windows; in the street behind the actors, there is non-stop traffic. Serenity in the foreground; mayhem in the background; and it is exquisite. Plus, Sunrise was one of the first movies to have an actual soundtrack and sound effects, It was released just ahead of another groundbreaking film, The Jazz Singer. The film was a critical but not a commercial success. There have been many reasons cited for this; we personally think the story is too weak to support the stunning cinematography. And just never mind that the hero of the story attempts to murder two women in a single 24-hour period! But we’re getting ahead of ourselves here. Sunrise is the story of a man (George O’Brien) who lives in a simple rural village with his wife and baby daughter. However, he leaves the house in the evenings to meet a vacationing “Woman from the City” (Margaret Livingston). Livingston, who slinks through the village in her high-heeled pumps and satin dress, is determined to bust up O’Brien’s marriage. Even worse, everyone knows this affair is taking place, especially the sad wife (Janet Gaynor). Gaynor won an Oscar for this picture*, but it is Livingston who gives it traction. She is delightfully wicked as the wanton woman, with her sleek Don’t-Mess-With-Me wardrobe. Gaynor, on the other hand, is believable as the virtuous, hard-done-by wife with a hairdo that reminds you of a Ukrainian stacking doll. O’Brien is very good here, too, and in his murderous phase(s) he looks startlingly modern with his unshaven face and unkempt hair. But we, as viewers, can never really trust his character. His attempt to drown angelic Gaynor in the lake doesn’t elicit much sympathy. To sum: Should you see Sunrise? Yes. Will you be awed by the special effects and its beauty? Definitely. Should you expect to sit on the edge of your chair while watching it? No. But if you have a passion for films that make you gasp at its beauty, we urge you to see Sunrise. *Note: In 1927, acting Oscars were given for the year’s work. Gaynor appeared in three films that year. Sunrise: A Song of Two Humans – starring George O’Brien, Janet Gaynor, Margaret Livingston. Directed by F.W. Murnau. Scenario by Carl Mayer. Fox Film Corporation, 1927, B&W, 95 mins. Hi, R.A. — I enjoyed your write-up (as usual)! I also greatly enjoyed Sunrise — and I’m no silent movie fan, generally speaking. I watched it for the first time, though, online during a TCM Party and I think that increased my viewing pleasure. Anyway, it gets a thumbs up from me — as does your take on it! Thanks so much! I really feel conflicted about this movie, but it’s too gorgeous to not see. I am shocked!!! I didn’t see this coming at all. I was able to watch ” Sunrise” for the first time this last summer and it moved me to tears. I have watched it six times since and continue to enjoy the film more each time. Its funny to hear you talk about all the amazing technical aspects of the film, yet still not enjoy it because of the story. I do find it hard to get back into O’Brian’s corner but his pain towards the end always brings me back. You are however not the only person who feels this way as my wife has yet to make it through the film without falling asleep! I can sympathize with your wife, that’s for sure! As far as the story goes, I can’t really identify with any of the characters, even though I realize they are representative of the human condition. I was moved by your reaction to the film and I think maybe I’ve been too harsh. There’s been more than a couple times when I’ve left a movie theater, having just watched “one of the year’s best films”, wondering what all of the hoopla was about. I’ve not seen this one. The number of silent films I’ve watched is woefully inadequate by any standard of measurement. Your review, though, has piqued my interest for the cinematography, if nothing else. It really is worth seeing. They were a clever bunch, these filmmakers. It’s a terrific blogathon idea, isn’t it? So much fun to pick award-winning movies to write about. Yes, Sunrise really is worth seeing. Most people love it, so I’m definitely the odd man out. Sunrise is one of my all-time favourite films. I have seen it entirely too many times, even for a silent film fanatic and critic. Its true appeal is deeply and enticingly subtle, and creeps up over you in time. I will give it another go, and I can imagine liking it better with time. However, right from the first frame I loved how Murnau composed his shots, and the clever sets they used. I love love love the cafe in the city. It is visually stunning in a way few films are! I definitely think it is worth watching again, with a different set of expectations and a different set of tools. That often works for me. Of course, there is still a large chance that you won’t like it no matter how many times you view it, but at least you will know once and for all that it is not your cup of tea. A refreshingly honest post. Oh, and one I happen to agree with. I want to give this film another look as I’ve only seen it once but my impression was just as you describe – an awe for its look and several scenes are breathtaking in their complexity and beauty. However, I wasn’t impressed with much else. Great addition to the blogathon!! Thanks, Aurora. I felt a bit bad about not raving about the film – I had planned to do it before I even saw it – especially for a blogathon! I will give it another go now that I know what (not) to expect. I love the entries in the 31 Days of Oscar blogathon. Such a wide variety of films and writers. It’s a lot of fun! Still laughing at your describing Murnau as a show off then Gaynor’s hair as a Ukrainian stacking doll. Priceless and spot on! While I liked the film for most of the reasons you’ve so beautifully described, I wouldn’t list it as a masterpiece or the best film even of that era. Gaynor was a great actress and I think she deserved her Oscar. I preferred her performances in “7th Heaven” and even “A Star is Born” though but that’s just me. Murnau was quite clever and his skills show throughout the film. For that I’m grateful. He was the right choice. I, too, loved Gaynor in “A Star is Born”, but haven’t yet seen 7th Heaven. On the Sunrise DVD that I watched, there were outtakes with commentary by a cinematograher. It was highly instructive, and helped me more fully appreciate Murnau’s techniques. But it still needed a stronger story. Thanks for stopping by! Ruth, I watched SUNRISE on TCM’s The Essentials a while back. I’ll admit it’s often gorgeous to look at, though the narrative was kinda hit-or-miss for me. 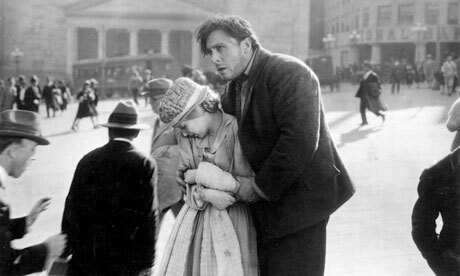 I realize one must view it from Murnau’s era and viewpoint; don’t hate me because I’m modern! 🙂 I must also admit you cracked me up with your bon mots about Janet Gaynor resembling “a Ukrainian stacking doll!” Either way, it’s worth watching at least once to see what moviegoers were watching back in the silent days. Great review, as always! Hey Dorian, you’re right about seeing this film at least once, if only to know what everyone is talking about when it comes to the memorable films of the silent era. Great post yet again, Ruth, and kudos to you for sharing your honest mixed feelings about SUNRISE. I’ve only seen snippets of this film and what I saw was indeed a technical marvel. I also have to admit a woeful gap in my film watching when it comes to silents. I’ve seen several and have pretty much got something special out of every one, but there’s so many titles I have to catch up with someday. And there’s no denying that sometimes “important” films can be a slog. You said it, Jeff. I will give this film another go, but it does have a “this is good for you” aura about it – kind of like brussels sprouts. My reaction to “Sunrise” was similar to yours. Found it beautiful, but my attention wandered at times. Agree that it’s a must-see. On the vegetable meter, I’d say I liked it better than brussels sprouts, about the same as broccoli, but much less than eggplant. Ha ha! I LOVE the vegetable meter. And I am so glad to hear others reacted to the movie the same way I did. Thanks for dropping by! I really do like the movie, but won’t shun you for getting bored. It took me 4 days just to get through “Greed.” I kept falling asleep! One person once said the sunrise was an allegory? Or an extended metaphor? One of those literary terms…but for what? I have no idea. I can accept that Sunrise is a metaphor (of the human condition?) but I like my metaphors packed with a little more action. 🙂 I have not yet seen GREED, and am a little reluctant to… If it it took you 4 days to get through it, then I am without hope. The problem with Greed is a great deal of it is missing, so not only is it a 4 hour movie….it’s a 4 hour movie of mostly photo stills!